The system field SY-UNAME contains the name of the currently logged-on user and is quite frequently used by developers to facilitate tests by adding special conditions to their code. The block of code that is executed depending on the current user's name is usually only intended for the developer him-/herself. Although developer guidelines almost always include the obligation to make use of AUTHORITY-CHECKs, these checks might interfere with functional tests – and people might want to circumvent them (just for the tests, of course). No matter what the intention was, this approach leads to programs that do authorization checks for all users – except for the developer of the code... bad thing! IF sy-uname &lt;&gt; 'DEVELOPER'. AUTHORITY-CHECK ... ENDIF. If we consider malicious behavior, such code is called a backdoor and/or hidden function and this means that there is a need for action (at least to protect your developer colleagues)! 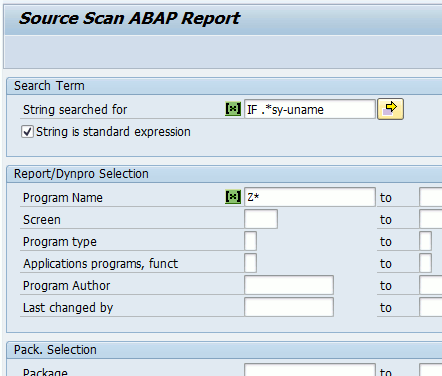 To find affected code, the SAP standard report RS_ABAP_SOURCE_SCAN is of great help — you can use it to search for plain strings or expressions in reports, classes, etc. Since we're interested in IF conditions that check the value of SY-UNAME, I'd suggest to search using "IF . 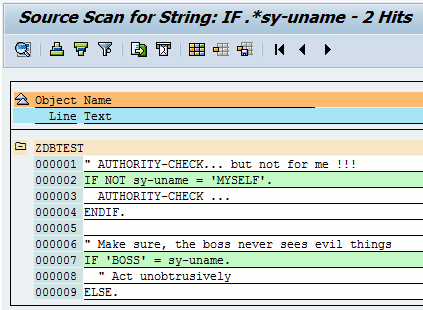 *sy-uname" as the expression and tick the checkbox "String is standard expression". In the sample below, I limited the code to search in to programs with name Z*, but you might probably want to adjust this according to your needs (e.g. your registered namespaces). DATA: foobar TYPE syuname. foobar = sy-uname. * Obfuscated condition IF foobar &lt;&gt; 'MYSELF'. AUTHORITY-CHECK ... ENDIF. So – when you establish controls to prevent the usage of user-based conditions, this is something to keep in mind. Code that is bypassed based on the value of SY-UNAME should never be used! ➡ All instances of hard-coded user names in customer code used on productive systems should be corrected. ➡ Controls should be established to prevent such code from being transported. 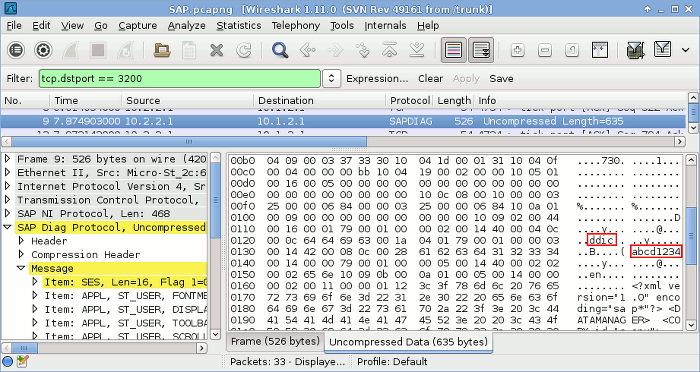 You might want to integrate the use of the SAP code inspector into your transport process. 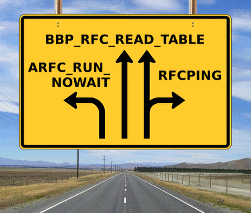 After a relaxing summer holiday, it's time to fulfill the promise I made in my last post and provide the evaluation report for our log of RFC calls. If you don't know what I'm talking about, please read the first part of this article. This report basically parses the RFC log and shows the function groups that would've been required to execute the called modules. 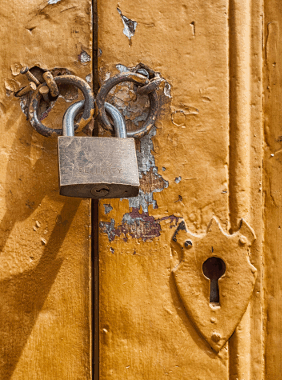 In addition, it finds out, whether the respective users currently have the required S_RFC authorization — therefore, it allows you to focus on those entries, where the authorization is missing. Create a new program in SE38 and copy-paste this source code. 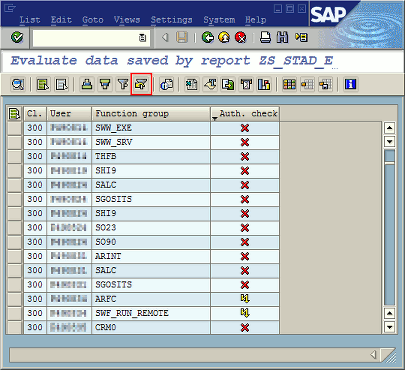 Set a program authorization group in the attributes section. Activate the program & execute it. There is only one noteworthy feature: the "Client" field is pre-filled with all clients, for which no RFC connection could be determined automatically. 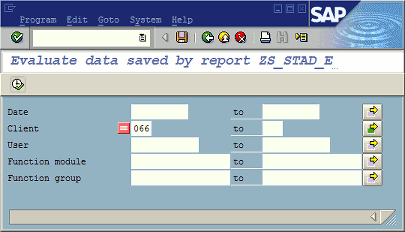 The report checks the logical systems for all local SAP clients and tries to reach them via the assigned RFC connection (that should normally work in a well-configured system :wink:). If this attempt fails, the respective client is excluded from the evaluation. Just log on to the excluded client(s) and run the report locally – this will always work! The screenshot below shows an exemplary result. All lines with function groups, for which authorizations exist, are hidden per default; to unhide them, just remove the filter (marked in red below). 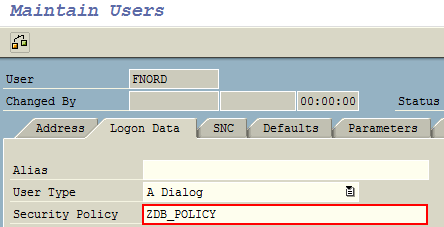 This time I'd like to present a hot new SAP feature to you: Security policies! The system behavior regarding password rules and logon restrictions is controlled by profile parameters, e.g. "login/min_password_lng" for the minimum password length. These parameters are valid system-wide and could not be overridden by any means. With the new security policies, it is now possible to define different sets of password rules, password change policies and logon restrictions and assign these policies to users. This provides the flexibility to segregate users and assign an appropriate policy to each of those groups of users! For instance, you can enforce strict rules on the global level (= profile parameters) and loosen them on user level via a security policy (e.g. 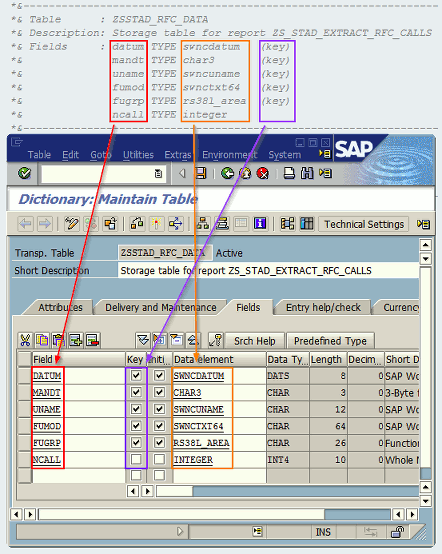 increased validity period of unused initial password for users, who use SAP less frequently). For users with a security policy assignment, the attributes defined therein override replace the profile parameters – for users without a SecPol the parameters stay relevant. The administration of security policies can be performed via the new tcode SECPOL, which is secured by two brand-new authorization objects: S_SECPOL is checked during the maintenance of the policies themselves, while S_SECPOL_A is used to define the values that may be assigned to the security policy attributes. … then mark it and switch to the attribute maintenance screen by double-clicking on "Attributes". The button "Effective…" shows the relation of the policy values to the default ones (=, ≠ or not set), while the "Superfluous Entries" button identifies unnecessary entries (i.e. identical to the default ones). Mass-assignments via SU10 are of course possible, too! To be able to assign a SecPol, you'll need the authorization object "S_SECPOL", which behaves similar to S_USER_AGR – i.e. activity 22 (assign) and the policy's name are checked. The security policy ↔ user assignment is supported by the CUA and its distribution can be configured via SCUM as usual.